American Retail Supply offers a large variety of Food Packaging. These supplies are used for providing protection to your items. 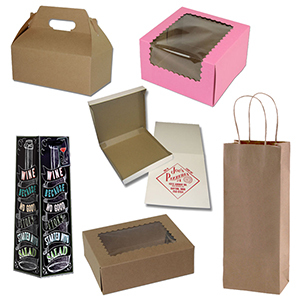 Food Packaging can mean take-out, catering, bakery supplies, coffee bags and even tissue. All products are FDA approved for food contact. Not only do you want to find packaging that is food safe but also attractive. Here at American Retail Supply we can help you find exactly what you need. Food Wax Tissue can be used for basket liners, food wrap, carry-out box liners, small sandwich wrap, hot dog wrap and pastry handling. Food Packaging Bags are ideal for carry-out. These bags will make it easy for guest to take home their leftovers. Bakery supplies are another great food packaging. This includes cake boxes, cupcake boxes, cupcake inserts, cake pads and more. Cello Bags can either be printed or clear. These bags are the perfect food packaging for candies and treats. Choose from 22 different Coffee Bags. Use Coffee Bags in a grocery store, coffee stands and more. Wine Bags & Boxes come in paper or Non woven. Use Wine bags for gifts or even customers.